So why do I say it’s a bubble? Let’s ask ourselves what is driving Bitcoin’s price at the moment. Almost all of the demand is based on expected future adoption by consumers and merchants. If that adoption never materializes, Bitcoin will come crashing down pretty hard. Litecoin, on the other hand, has a 0% chance of being adopted on a large scale by consumers and merchants so long as Bitcoin is still functioning. Why is that? Because the market has a tendency to consolidate around a single commodity as a medium of exchange. The network effect is an economic phenomenon where the user of a good or service has an effect on the demand of others. A perfect example of this phenomenon in action is Facebook. Anyone is free to build a competing social networking site. You could probably easily make one that is better than Facebook and has better features. The problem is that the primary reason people use Facebook is because everyone else does. Why should people use your social networking site if nobody else does? Consider how the largest brand in the world (Google) with billions of dollars cash on hand has barely been able to compete with Facebook. G+ is still largely a ghost town. There’s your network effect in action. The network effect itself may ultimately prevent Bitcoin from gaining traction and competing with the dollar. Everyone uses government fiat money. To get people to switch off dollars, the alternative has to be vastly superior. Fortunately, Bitcoin is superior, and the recognition of this has driven merchant and consumer adoption thus far. But what about Litecoin? To overcome the burgeoning network effect that Bitcoin is establishing, it would need to be vastly superior to Bitcoin. Is it? In a word ― no. Litecoin is little more than a copy and paste of Bitcoin’s source code with a few meaningless changes. 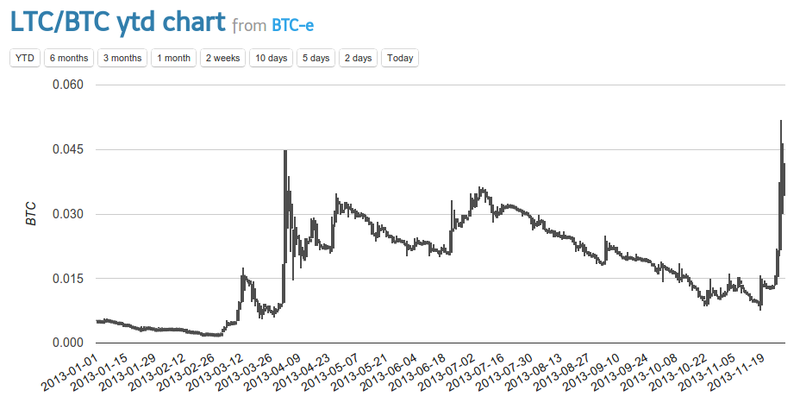 It’s one of the most unoriginal altcoins out there. Neither is it “silver to Bitcoin’s gold” as it’s advertised. Silver coins at times traded alongside gold because they were more abundant and easier to use in small value transactions. Since Bitcoin is easily divisible, there is no need for a “silver” currency. Why then is Litecoin surging? It really beats me, but if I had to guess I would list several factors: 1) Litecoin investors don’t understand the network effect and are under the false belief that if Bitcoin takes off there will be room in the market for multiple currencies. 2) Litecoin investors are speculating that if Bitcoin crashes, Litecoin will step in to take it’s place. If so, this is a crazy bet since Litecoin shares 98% of the code base. Any flaw that takes down Bitcoin will almost certainly take down Litecoin as well. 3) Litecoin investors have fell for the crude propaganda that it is somehow better than Bitcoin and destined to surpass it. So let’s talk for a moment about some the false advertising surrounding Litecoin. The most common myth is that Litecoin has faster transactions. No matter how you slice it, this argument is false. To see why let’s take a look under the hood. First, transactions in both Bitcoin and Litecoin are transmitted instantaneously. Technically, since there are more Bitcoin nodes, a Bitcoin transaction will propagate and reach you a few tenths of a second faster. So already the “Litecoin transactions are faster” myth is mostly busted. However, in both systems transactions could potentially be reversed by an attacker in the minutes after the transaction is broadcasted, although it isn’t easy for someone to pull off this attack. An attacker would need a lot of technical skill (it’s not something the average user could do), access to a lot of processing power (potentially millions of dollars worth) and a lot of luck. In both Bitcoin and Litecoin this attack becomes increasingly more difficult to pull off with each additional block that is added to the block chain. If six blocks have been added to the chain after your transaction, say, the attacker would need to generate six blocks in a row faster than everyone else collectively to reverse the transaction. Whether he can do this is a matter of probability, but after six blocks the probability is near zero. Now this is where Litecoin advocates claim superiority. Since Litecoin is designed to generate blocks every 2.5 minutes instead of every 10 minutes as in Bitcoin, they claim Litecoin can reach the point of irreversibility four times faster. But again, this is false. What people who make this claim fail to consider is that while it’s true that the probability of generating six blocks in a row is the same whether the block interval is 2.5 minutes or 10 minutes, in Litecoin an attacker has four times more chances to pull off this attack. Now I’m not very good in math so I’ll leave the calculations to others, but when you add these probabilities together, it just isn’t the case that six confirmations in Litecoin offers the same security as six confirmations in Bitcoin. More likely you would have to wait much closer to an hour (same as Bitcoin) to get a similar amount of security. If anything, Litcoin only reaches that security level marginally faster. But there are more problems. The above analysis would only hold true of the Bitcoin and Litecoin networks were the same size. They aren’t. The Bitcoin network is 126 times larger than Litecoin’s at the moment. That means an attacker needs to expend many more financial resources (probably millions of dollars more) to pull off such an attack in Bitcoin than he would in Litecoin. So when you consider this aspect, you would have to wait hours (days?) to achieve the same level of security in Litecoin compared to what you get with six confirmations in Bitcoin. In other words, Litecoin is much slower. The “Litecoin transactions are faster” claim is uniformed at best and fraudulent at worst. I should also mention that there is a reason why Satoshi chose 10 minute block intervals instead of a lower number. As the number of transactions in each block increases (and the size increases), blocks propagate slower through the network. If the block interval is low, this increases the risk of orphaned blocks and reorganizations. In fact we’ve seen this in Bitcoin already. As the hash rate has been skyrocketing with the rise of ASICs, there are times when the block interval reaches 5 minutes before the next difficulty adjustment. When this happens the number of orphaned blocks increases and resources go to waste. I know at least one mining firm that would limit the number of transactions in some blocks (to as low as 30), in an attempt to get it’s block’s to propagate faster so it wouldn’t lose the block reward. Obviously that is unacceptable. I thought about that but there wasn’t a practical way to do smaller increments. The frequency of block generation is balanced between confirming transactions as fast as possible and the latency of the network. The algorithm aims for an average of 6 blocks per hour. If it was 5 bc and 60 per hour, there would be 10 times as many blocks and the initial block download would take 10 times as long. It wouldn’t work anyway because that would be only 1 minute average between blocks, too close to the broadcast latency when the network gets larger. At the moment Litecoin isn’t experiencing problems with this because it’s network is tiny. But if it had to scale to Bitcoin size or beyond, it would almost certainly have problems. Again, there’s a reason why Bitcoin’s block interval isn’t less than 10 minutes. There’s more I can say about Litecoin, but I think I’ve made my point. If Bitcoin is going to be dethroned, it will be by some other digital currency that uses an entirely different approach to improve on some of Bitcoin’s deficiencies (if that’s even possible). Litecoin, being nothing more than a clone of Bitcoin, is not that currency. Given that, I can’t see how it could retain any value long term let alone justify a billion dollar market cap. The Litecoin bubble may continue for years, but at some point people will wake up and realize there is virtually no merchant and consumer adoption and bubble will burst. Just make sure you get out before that happens. As someone new to cryptocurrencies, I can’t argue with this post but I can give a real world example of one of Litecoin’s perks. One of the reasons I went with Coinbase was because they allow you to purchase crypto via credit card (not yet confident enough to link to a bank account). Unfortunately, Coinbase doesn’t yet allow trading in BCH. Kraken OTOH, is the exact opposite. So, to buy BCH using a credit card, I had to buy crypto through Coinbase and move it to Kraken where I could trade it for BCH. The first time, it cost me an equivalent transaction fee of $3.46 to move $20 worth of BTC from Coinbase to Kraken. The second time, it only cost me an equivalent transaction fee of $0.02 to move $20 worth of LTC to Kraken. Plus, it took half as long for it to show up in my Kraken account. ← Creepy Libertarian Guys Are The Reason For The Lack Of Female Libertarians?